Recently I have received requests from readers of the site, asking for help on particular issues or problems they have come up against when researching their family history or when exploring their roots in Ilkeston. I have tried to help, though not always successfully or as fully as I would have liked. Consequently I have introduced this new section where in future I will post such requests in the hope that there are others who feel that they can join in and help. And if you can add anything you can send your help via one of the same routes. I have begun the page by listing the latest questions sent to me. If you have sent one earlier and would let to ask again, please feel free. I used to live in Long Eaton and visited Ilkeston not realising some of my ancestors lived in the town. 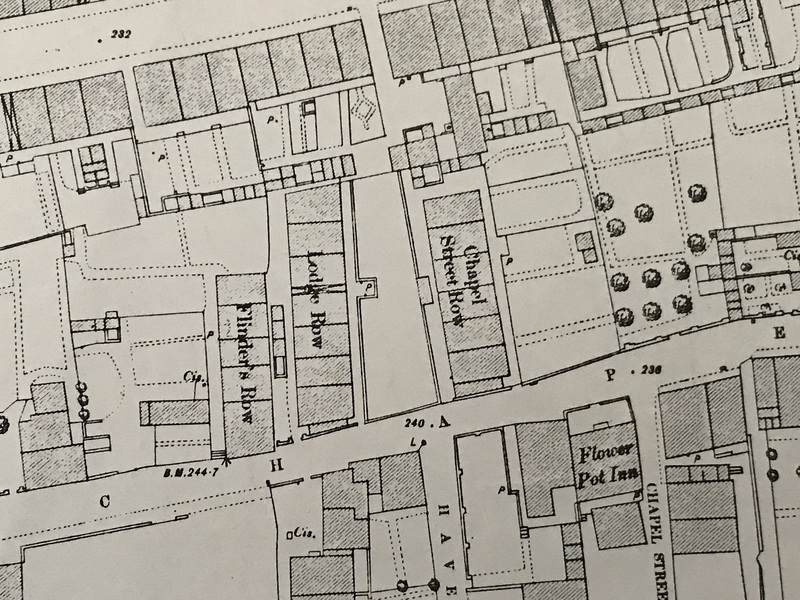 I’m gathering a lot of good information from my ancestry membership but does anyone have any pictures of 1 Chapel Row on Chapel Street from around 1900 as Henry William Smith (my great grandfather appears at the address in the 1911 census as a 15 year old boy. His occupation is a coal miner pony driver underground. Any idea which pit he would have worked? thanks for any help. This is the area in 1880/81 … I suspect it would have changed little by 1911. Obviously not a photo … though there is one to be found on ‘Picture the Past’ website (for 1973). Do you have any information on a Joe Frost (of Ilkeston c1930s-50s) who split from his wife to become a tramp? It’s something my dad told used to tell me about, and that his sister used to feed him from time to time. All I know is the story my dad used to tell me, I found him and his wife (with his dad and a child/children) on the 1939 register, they were living at No 46 Albany Street. Dad used to tell me how his mum; Joe’s sister (my grandma); used to give him a dinner from time to time. Something had happened between Joe and his wife Lottie (that’s the name recorded on both the marriage registration and the 1939 register), and the words my dad told me Joe used were along the lines of “… she’ll not get a penny piece from me, I’d sooner tramp the streets” which he did. Joe’s date of birth; as given on the 1939 register; is 6th March 1902, and he was working as a Colliery Deputy. I’m unsure whether it was Joe or another Frost member, but dad used to tell me of how a Frost ‘thug’ used to carry a gun about him. I’m new to all this but I’ve been searching family on my dad’s side … there seems to be a lot my dad George was one of nine children his dad Richard Alfred was born in 1896 married Harriet Waterall .Richard’s dad is also called Richard and his dad is Richard. Most of my family are from Ilkeston or surrounding areas. It would be great to get an invite into their lives as I know very little at the moment. I’d rather like to ask through these pages if anyone has any information on one John Severn of Ilkeston with regards to the 1841 census. John was Christened on 6th March 1816 in Ilkeston to William Severn and Phoebe Leggitt, I know he was married to one Emma Ride of Muggington/Weston Underwood in 1838 and together they had two children; Matilda who was born in 1839, and John who was born in the 4th quarter of 1840. Emma and her young son (John) both died in 1841 prior to the census of that year being recorded, I know that their daughter Matilda was living with her re-married grandmother Pheobe (who’d married Thomas Bennett), but its the whereabouts of Matilda’s father (John Severn) I’m after as he seems to have disappeared – it must have been hard for him after losing his wife and son. From what I’ve found out, Matilda never lived with her father again, but John did live in Ilkeston as he’s found on the 1851 and later census. I’ve looked to see if John went to see his wife’s parents in Muggington/Weston Underwood, but he’s not listed with them, so I’m out of ideas of why to look for him. I am interested in a Joseph Moore born about 1820, son of William Moore and Ruth Davis of Shipley. Joseph was transported to Tasmania in 1845. I would like to know what became of him, because he could be the same person as my husband’s ancestor who lived in Hobart, Tasmania in the 1850s. I would really like him to be my husband’s ancestor Joseph Moore born 1819-1821 in England and living in Hobart from at least the mid-1850s, but so far I can find nothing that might connect the two men, apart from their ages and that they were both Methodist. Joseph the Convict was a tall man for his time and Joseph the Tasmanian’s son was also tall. Unfortunately the Tasmanian marriage and death certs don’t list parents. If anybody can help I would be very grateful. Isaac Beardsley was born in Kirk Hallam around 1792 and married Mary Dowman in Ockbrook in 1823. He was a frame smith for most of his life, then became a beer retailer. They lived in Ockbrook and had children Thomas, Ann, Harriet, John, Elizabeth, Caroline, Edward up to1841, then Hannah and Jane. I am trying to find Isaac’s parents from Kirk Hallam. Isaac died in Ockbrook in 1864. I am overseas so haven’t been able to visit these places yet and others have told me that some of the parish baptism records are not yet on line. Would you please ask Linda Mott to contact me re the Harrison conundrum. Are there any Harrison Researchers who might be interested in my research? I am a GGGrandson of Joseph Harrison by way of his son John, his grandson William, and his great grandson William. My grandmother was also a Dawson. Her name was Hannah and was the daughter of Peter Pearson Dawson, who was the brother of the William Dawson Jnr in this article and I would so much like to find out more about William senior. I believe he was from a boat family as the earliest I can find someone to match is William Dawson age 20 in Barlaston as a boat builder in 1841 and every subsequent detail matches your article. So any help would be appreciated. I was aware but have never traced a member of the family who actually created the Dawson family tree and had over 800 living relative but this was over 10 years ago or such. I am researching my friend’s family tree for them and am looking for information on George Dennis Straw who was born in 1916 in Basford. He married a Joan Margaret Bantock in 1939 in Ilkeston and died 21st July 1969. I am wondering whether any of your readers have any information on them in particular if they are buried locally or if anyone knows who Joan’s family were. When did the Flower pot pub close? I am not aware of the precise date of its closure. It stood not far from where I lived in Ilkeston and I recall a few occasions when I visited it in the late 1960’s and early 70’s. It closed and was demolished in the 1990’s … another sacrifice to the Chalons Way ?, although not on the direct route (there is a car park there now)… but the exact year I don’t know. Perhaps someone else could help? From Lesley Hampton (Oct 5th 2016) …. I am researching a gggg aunt of mine (Eliza Jane Tamlyn of Sedgley), who was married to a priest – JRF Meek. I saw on the 1841 census that he was the clerk at the vicarage in 1841. He was ordained at Chester 1822 and took his B.D at Cambridge 3 years later. I was wondering whether you have any more info on the family – photos would be brilliant! Can u help me trace an 85 year old chap called Joe Payne? He was in Chilwell Nottingham, Ordinance Corps 1948-1950. I have just met an elderly gentleman who would so love to make contact with his old friend. He came from Ilkeston. Can anyone help trace him or his family? My great grandfather was Thomas Straw Mather who was the illegitimate son of Elizabeth Straw I believe. His son, from his marriage to Sarah Beardsley, is Arthur who is my grandfather. Arthur died in 1955 before I was born. My problem relates to the 1911 census for my grandparents – Arthur Mather and Elizabeth (Hartshorne) – which states that at the time of the census they had had 9 children, 4 living and 5 that had died. These children would be my Aunts and Uncles. Obviously, I know of the survivors but I had no idea of these deaths until seeing this census and, on and off for the last 5 or 6 years, have tried to establish who they where without total success. I believe one was an illegitimate daughter named Florence (I don’t know for certain if this was Arthur’s daughter of Elizabeth’s but I have found a birth in 1896 with a surname of Hartshorn(e) which may or may not be her. I cannot locate a death record though. She appears on the 1901 census as a “Boarder” but then disappears. On this census, Arthur, Elizabeth and Florence are boarders at Elizabeth’s parents on Lord Haddon Road. Florence’s birth is stated as Ilkeston and, at the age of 5, would have been born before Arthur and Elizabeth married. I have found two Mapperley Parish Church records which confirm that two of the unidentified birth/deaths were Catherine (1898) and Arthur Henry (1899/1900). Can you help me identify who my remaining two Aunts/Uncles may be and shed any light on what happened to Florence. I realise I could purchase copy birth certificates but I don’t know which to ask for as there are numerous Mather births within the period I am looking and don’t particularly want to speculate by buying numerous ones. Following the 1911 census, Elizabeth and Arthur went on to have another 6 children – including my mother – of which another 3 died in infancy. 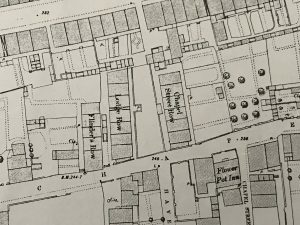 I would love to get more information on William Sanders and the other Sanders family that occupied the thatched house on South Street / Derby Road Junction. These were my great, great great & great great great grandfathers father’s. They occupied the property for 130+ years but would love to hear more. Previous to the Sanders family occupying this house it was possibly called the Cross Keys Inn and before that the Sun Inn. I believe the property could date back as far as the 16th century. The house was finally destroyed in 1933 and the family moved around the corner to 13 Moss Road. Any help would be greatly appreciated. Help wanted in Nottingham Road !! I have had a question from Dave Longden about what he refers to as ‘The Gatekeeper’s Cottage’ at 201 Nottingham Road. This is the white house standing on the right-hand side of the entrance road to Kensington Business Park (just south of the Tesco Express on Nottingham Road). He would like to know if anyone has any information on the history of this house. and Mary Morley born about 1826 according to the 1841 Census ( this is the Mary who had two illegitimate children with George Wright the landlord of the Spring Cottage Inn). Would you also have any idea which school John Morley would have been a schoolmaster. ?